All little girls and boys want to copy their mums and dads on their cleaning days around the home, and with a great series of branded Hetty toys, there’s no excuse for the kids to miss out on one of their least favourite household chores! The Little Hetty Vacuum Cleaner looks just like Numatic’s real thing, and includes accessories like a dust pan and brush, hose and suction nozzle, all of which can be stored inside the body when not being used. Even the pretend electric cable can be reeled in by turning a handle on the top of the cleaner. Just like its twin Henry version, the Hetty Cleaning Trolley is the ideal addition to go with the Hetty vacuum cleaner. As well as its wheel around trolley base, there’s a great collection of cleaning tools to go with it including a pretend detergent bottle, long handled brush, fabric floor cleaning cloth and a floor mop for wiping up liquid spills. 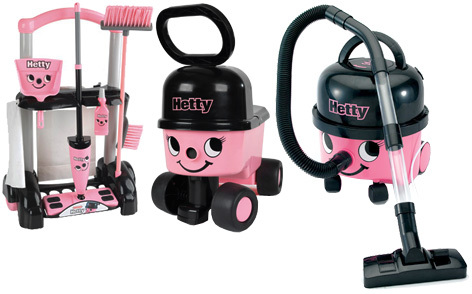 Hetty’s cheerful face is always there to let kids know they have to keep smiling during the cleaning time! Suitable for children as young as 12 months old, the Hetty Sit n Ride toy has a large storage compartment under the seat, and can be steered around obstacles using the large handle above Hetty’s face. Suitable for indoor and outdoor use, this toy is a terrific first vehicle for ambitious toddlers. Please tell us what you think of Casdon's Hetty Toys by Casdon. The Hetty range is fabulous! Retro chic at its best. As much for the parents as the kid you're actually purchasing for. Sturdy, fun and family friendly!